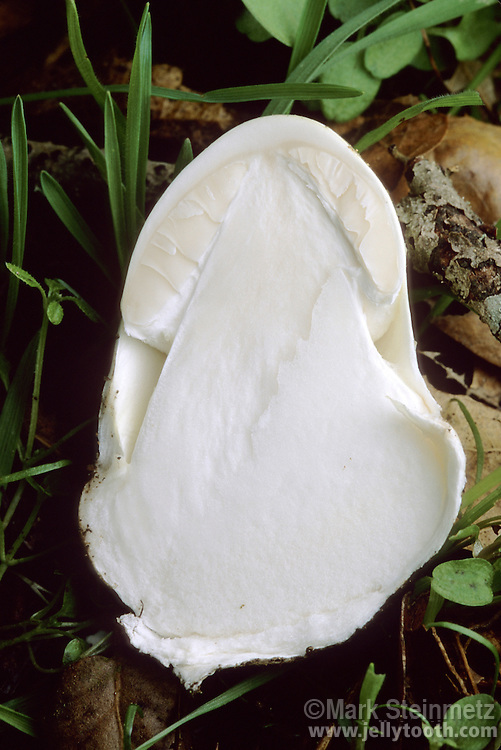 Part 3 of 4: Cross-section cut of the early stage in the development of a deadly poisonous Amanita (Amanita phalloides) fruiting body, with universal veil still completely covering the mushroom, giving it an egg-like shape. The developing cap, gills, and stem can clearly be seen, and will soon push up through the top of the veil. Due to its superficial resemblance to a white edible puffball, such a cut should always be made before eating puffballs to eliminate the possibility of mistakenly eating this deadly mushroom and related Amanita species. Point Reyes National Seashore, California, USA.